Our cube planters are new in 2016. Besides coming in more sizes than any other concrete pots these are contemporary and wonderful. Putting a group of these planters together to make a wonderful display will be easy and fun to do. 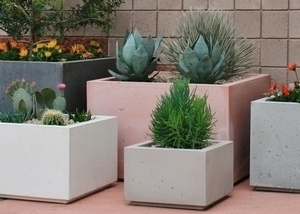 Simple lines, basic box shapes and perfect for filling with colorful flowers, shooting palms, cactus or succulents and create a wonderful display that will compliment your landscaping. Place on a pedestal, next to a front entryway or on a patio or pool area.